Horse racing has been trying to tap into new markets in an attempt to add its fan base (which is dying out quicker than it can be replaced). Biggest problem is that there is a huge learning curve, and the fact that there are few long term winners and virtually no visible long term winners, there is close to no reason for a new gambler to learn how to play, and there is very little motivation for existing sports bettors and poker players to take up horse race handicapping and gambling as a hobby. I'm optimistic that horse racing will soon wake up and reduce takeout levels to more optimal percentages, and it may take exchange betting (which I believe is inevitable) to get those in control to really see the light. But for now, horse racing desperately needs to get what it can take in the way of gamblers, and one way that really hasn't been tried is a widespread Fantasy Game that is easy enough to figure out. Fantasy Sports is huge. It is estimated that over 32 million people in the US and Canada played Fantasy Sports in 2010. If horse racing could just appeal to .5% of that crowd (160,000 people), there would be a huge chance for major growth. The demographics Fantasy Sports attracts is mouth watering for the horse racing industry. Close to 25% of males between 18-49 play Fantasy Sports. I've been playing Fantasy Football for close to 20 years. I used to play other sports as well but found the seasons to be too long, and the day to day monitoring was like having a part time job (This is why each Fantasy Horse Racing game needs to be of short duration, and because of that, can't include horses as some may race only once in a 10 week span, and some none at all, and monitoring horse injuries becomes too complicated). Now for my idea of what the new Fantasy Horse Racing game should look like. Jockey must be an apprentice when the contest is announced. Substitute Bench consists of 5 jockeys and 5 trainers. Switches can be made weekly (by Sunday night for the following week). There are also 8 total roster changes allowed as well, where you can switch a trainer or jockey from your current roster or bench with someone currently not on your team. Points are determined by adding overall rankings in each category. For example, if one is ranked 230th overall in trainer wins, 3rd in jockey wins, 245th in trainer ITM, 18th in jockey ITM, 163rd in Win %, 143rd in ITM %, 111th in jockey purses, and 212th in trainer purses, total points for this player would be 1,125. The lower the total the higher one is ranked. There could also be league totals where friends can choose to go into specific leagues or a player can be put into a league randomly, and leagues can consist of anywhere between 25 and 100 players (and individual league prizes can be awarded). Jockey and trainer values: To keep from everyone selecting a Ramon Dominguez, for example, each trainer and jockey has to have a predetermined value. The live roster can have a value cap of $1 million for example. Ramon Dominguez may have a value of $150,000, while another elite jockey, may have a value of $80,000, while another elite jockey may have a value of $110,000. Values are determined based on a formula (which I haven't perfected yet) that takes into account how points are awarded in this fantasy game taking into account last year’s individual stats. So up and comers will most likely be valuable to have on ones roster. Jockeys and trainers available to be selected for the game can only show up in one sub group. For example, if an Apprentice is an Elite jockey as well, he or she would show up under the Elite sub group only. New games during the year, can adjust for current production (in other words, a trainer or jockeys value can be based on the previous 365 days, not the last calendar year). Cost (Examples): Should be minimal, even free. The idea is to get new interest in horse racing, not cannibalize existing players (this is why an organization like the NTRA should perhaps run with it). If costs are required, no more than a $20 entrance fee. Weekly switches should be no more than 50 cents each, and new roster purchases should not be more than $2. Prizes need to be as high as possible. $5,000-$10,000 for the overall 10 week winner. $2-5,000 for second, $1,000-$2,000 for third, etc. Payouts to the top 10 leaders. $500 to $1,000 for winning a league if leagues are used. Weekly prizes of $500 for the top overall player for the week, and $50 for the top league player for the week. Wager at least $80 in total, win or lose, and you will get $40 deposited into your account. You will also start receiving industry high Player Reward Bonuses daily as soon as you start wagering. To earn the $40 Bonus you must wager at least $80 in total within 7 days of making your initial deposit. Horseplayers do not like deposit fees. 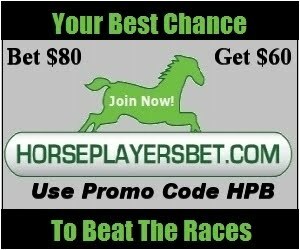 Horseplayersbet.com understands this and that is why next day deposit fee refunds are offered. Deposit $100 or greater online or by phone using a credit or debit card and the 4.5% fee will be refunded to your account the next morning. Deposit at least $100 using PINPocket and the 4.5% (+$1) fee will be refunded to your account the next morning. Deposit at least $120 using a Green Dot MoneyPak and you will receive $5 in you account the next morning. Deposit at least $400 using a MoneyPak, and $10 will be deposited in your account the next morning. Good news for the Fort Erie backstretch was announced this week. Fort Erie is getting funding for 7 more racings days, so they can prolong their race season to the end of October instead of the middle of October. The additional funding is coming from the HBPA. The Ontario HBPA is funded from a portion of the 2% additional takeout on all wagers made in Ontario (4% on triactors). Woodbine was able to negotiate that down to 2% on triactors last year and passed the savings onto the customer as takeout was reduced from 27% to 25% on that wager. It helped make Woodbine's product more appealing to their ever growing US base. Fort Erie on the other hand is literally hanging on by a micro thread. Total handle was down 19% last year, which was almost triple the North American average. The only bright spot was an increase in handle in the Pick 4, which was due to dropping takeout on that wager from 26.2% to 14%. The betting public is more and more aware of takeout, and at 26.2%, Fort Erie's takeout on doubles and exactors is an insult to those who have any knowledge about track takeout. But even those who are unaware (including on track patrons) just don't get enough gambling satisfaction from churn because of the high rate. In other words, Fort Erie is doing nothing to cultivate its live Horseplayer when it comes to gambling. Fort Erie needs to reduce takeout on doubles and exactors to the 20-21% range (Woodbine has a 20.5% takeout on these wagers). California A tracks are still suffering major backlashes and a tarnished image from raising takeout on two horse wagers from 20.68% to 22.68% at the start of last year. The four o'clock post time didn't work out. Probably an hour to an hour and a half too late. The later post time does make sense in the summer especially, and it is still something that is needed to get the dinner internet crowd on the later races. Sunday racing is close to pointless. Even Presque Isle Downs has figured it out and have done away with weekend racing this upcoming season. B and C tracks need to find niche times and dates. Fort Erie would probably do much better with a 2 PM post time on Wednesdays instead of racing on Sundays. Still not a fan of giving out so much money on faux allowance races. Fort Erie would be better served if they used those funds to prop up the purses for the $4,000 to $10,000 claimers. That is their niche, and at current purse levels, it is not economically viable to pay day pay for a horse that runs at Fort Erie. Fort Erie needs more owners as more owners wind up bringing newbies (potential new Horseplayers) to the game. I think by increasing bottom level purses and decreasing the higher end purses(or eliminating the higher end purses), that this could be achieved. Fort Erie also has to aggressively push patrons to ADW wagering. Right now, they use HPI but they do little to push their visitors to open online accounts. And those with online accounts in the Fort Erie home market don't receive any rebates through HPI. Woodbine's home market members at least receive something depending on their wagering levels. The biggest reason I don't think we will see any necessary changes is that Fort Erie is in the third and final year of a temporary bail out (a band aid) by the government. Unless there is certainty soon that the bail out will continue, I only see management having one foot in the door, one foot out the door. Without the same type of deal long term, Fort Erie will not have a chance to open in 2013, unless Nordic sells it to someone with deep pockets, and that seems highly unlikely. I do think the Consortium is doing their best to avoid closure, and they basically saved Fort Erie and gave it the life it has right now. But, and this a big but, they don't seem to understand the gambling public, or the direction horse race gambling is going these days. On a positive note, Fort Erie's website is very good, by the way. Free replays, free video and a free tip sheet. These are things that help, but the pricing of the bet is the most important thing these days. A study suggests that casinos would produce around an extra half a million a day to be given out in purses and breeder awards if Kentucky were to be able to put casinos in racetracks. That aint hay. In case you have missed it, horse racing appears to have their own version of Casey Anthony. The Paulick Report has done a very good job covering the story of Kelsey Lefever, who allegedly sold over 120 thoroughbreds to killers, many were supposedly acquired under the guise that the race horse was going to find a good home. Kelsey Lefever Case: How to Prevent the Alleged Practices? If only a 17.88% increase in handle in December was an apples to apples increase compared with December 2010. First off, race days increased 10% which should mean an approximate gain of 10%. Then you have the closing of the NYOTBs in December 2010 (the OTB player has by now found an alternative), and of course Gulfstream instead of Calder had to help handle numbers. Other factors to think about is the increased takeout in California which has a negative effect on handle overall, but then again, many tracks operating in December had lowered takeout on a few bets (like Hawthorne, Tampa Bay and Charles Town). However, signal fees have trended up from a year ago as well, which should decrease handle. If I remember correctly, weather was pretty ugly in December and January last year causing quite a few cancellations (but that is reflective in the amount of racing dates). And of course, the North American has improved ever so slightly. One more thing. The US poker ban in April should have had a very positive effect on handle, however, because poker is perceived as beatable and horse racing is not, the amount of poker players horse racing was able to lure in has probably been very minuscule. All in all, the December numbers look to me at best to be a wash over last year. Now, this is still an improvement over the 4 year huge slide we've seen, and perhaps a sign that the industry has bottomed out. But if it stays status quo as far as pricing is concerned, even a buoyant economy will mean very little when it comes to handle increases in the future. The reality is that the new blood the game desperately needs will not be cultivated the same way the current Horseplayer was (years of going to the track with mom and dad, etc.). The new player will be attracted to the game if and only if the game is perceived as beatable by at least a few. Tomorrow's player will not be required to go the track to become a regular and the industry has to understand this. Lower takeout across the board and betting exchanges are a must if the industry is to become relevant again.